The current net liquidation (i.e. mark-to-market, if you have any open trades) value of all your real broker accounts combined - or PaperTrade brokers if you have chosen a PaperTrade broker - is calculated. Your personal risk settings for “Maximum percentage to risk on a single trade (difference in percent between planned entry price vs. stop loss price)” and “Maximum percentage to risk on a single trade of total account value” are evaluated against each other and whichever is lowest is used for the calculation in step 3. 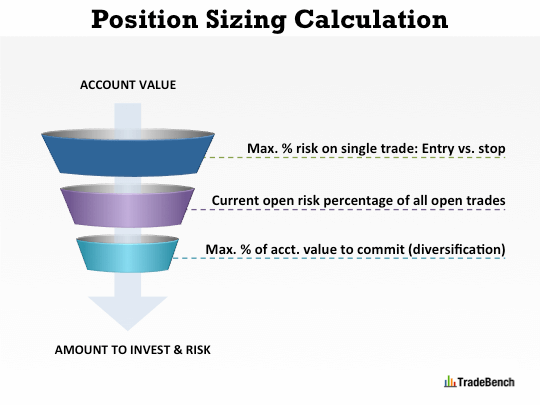 Your “Maximum percentage to commit to a single trade of total account value” is taken into consideration and the maximum risk amount calculated in step 3 is adjusted down if it exceeds. We now know how much money you can risk on the trade and thus can calculate how many shares, contracts, lots or units you should buy or sell at the entry price you have specified. This way you never have to think about position sizing - the system does all calculations for you, using your own risk and money management parameters.